Last Sunday we invited some friends for dinner, we were to be 4 hungry boys, just off the golf course, and 2 girls. Sunday is when I like to kick back so to keep it easy I decided to roast a chicken and I threw some potatoes in the same pan to get all golden and yummy(again with the keeping it easy theme). It takes minutes to prepare, the oven does most of the work; I get all of the glory! These are all the ingredients! First I toss the potatoes in a bowl with some olive oil, thyme and salt and pepper, along with some lemon wedges (‘cause roasted lemons are yummy). Then I put them in the roasting pan. Notice I pushed them to the ends of the pan leaving the center of the pan for the chicken (see picture below, 2nd from the last). I did this because I like golden, crispy edges on the potatoes. You could put the potatoes in the center of the pan and the chicken on top and the potatoes will soak up the juices and be tasty, but they won’t be crispy. How ever you like your potatoes is fine with me. I used a 7 lb roaster to serve six people, you can use 5 lbs for four people. A roaster has more fat, making it perfect for roasting so that your chicken will be nice and moist. I like to cut the back out of the chicken because it cooks quicker and more evenly (I put the chicken back in a freezer bag and into the freezer to make stock with later). Now I know some of y’all are chicken (pun intended) when it comes to cutting up a whole, raw chicken, so you chickens just roast the chicken whole, just add about 30 minutes to your cooking time. I used my hand to pull the skin away from the flesh start at one side of the breast and carefully pushed my hand all the way back to the drum stick. Starting at the drum stick, then the thigh and working my way to the breast, I put the thyme under the skin (sometimes I use rosemary, oregano, or marjoram) and the lemons slices on top of the thyme. Then repeat on the other side. The lemon juices will drip through and co-mingle with the thyme, the flavors really get into the chicken, and it looks pretty when it comes out of the oven. Then I salt and pepper the skin and the underside of the chicken liberally (if you’re leaving the chicken whole, season inside the cavity of the chicken as well). Coat the skin with olive oil and give the chicken a gentle massage to be sure every bit of skin is covered. If you have extra lemon and/or thyme, put it in the pan under the chicken (or inside of the whole chicken). I fired the chicken and potatoes into a hot oven (I always use a hot oven for chicken) and waited for the aromas to entice those boys in off the golf course (because they could totally smell them all the way from the golf course). When the chicken was done I let it rest for about 15 minutes. I served this delectable chicken with some good crusty bread for sopping (don’t let those juices go to waste) and a cool salad of nectarines, corn, tomatoes and feta that I saw on the “What’s Gaby Cooking” blog (her was peaches, corn, tomatoes and buratta cheese). 2. In a medium bowl, toss the quartered potatoes, lemon wedges, 2 tablespoons of olive oil, fresh thyme leaves, about ½ teaspoon of salt and ¼ teaspoon of pepper. 3. Place the potatoes in a roasting pan, pushing the potatoes out to the sides. 4. Cut the back out of the chicken (optional). 5. Run your hand under the skin of the chicken gently separating the skin from the chicken. Now under the skin, put first the sprigs of thyme, then place the round slices of lemon on top of the thyme. 6. Season the top and underside of the chicken liberally with salt and pepper (if you left the chicken whole then season the cavity of the chicken as well). Coat the skin in olive oil and massage it all over the skin. 7. Lay the chicken flat, tucking the wing tips under, place in the center of the roasting pan that the potatoes are in. 8. Put the chicken on the lower rack in the oven. 9. Baste the chicken and potatoes with the juices from the bottom of the pan, every 30 minutes. Turn the pan halfway through cooking so the chicken will cook evenly. 10. Jiggle the leg to see if the thigh moves freely and the juices run clear. If you have an instant read thermometer, put it in the thickest part of the breast, between the thigh and the breast, without touching bone; when it reads 165ºF the chicken is ready to come out. The chicken will take 1 hour and 10 minutes to 1 hour and 35 minutes (whole chicken will be 1 hour 30 minutes to 2 hours). When it’s done, pull the chicken out of the oven, cover it with foil and let it rest for 10 to15 minutes; the chicken will continue to cook (carry-over cooking) and will reach 175ºF. 11. Remove the potatoes and lemon wedges to a platter, placing them on the perimeter. 12. Carve the chicken and place it in the center of the platter. 13. Skim the fat off the top of the juices, and pour the juices over the chicken. Check this out at the Weekend Potluck! Also at Simple Meals Friday! YUM! :) This chicken sounds delicious. Love the golden color it has. This looks delicious! I never thought of stuffing the skin with lemon, we do it with garlic all the time. Ill have to give it a try! 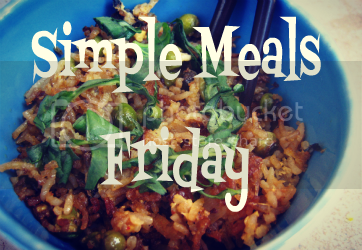 I would love it if you would share your recipe on my new blog hop Simple Meals Friday! Thanks. Thanks for sharing with Simple Meals Friday! I can'y wait to try this! You are this week's host pick! I hope you join us again this week.